Disclaimer : Iam Starting this post with a disclaimer. Because Iam not an expert with Elliot Wave. I made this post just to ask suggestions with the Ellioticians and Experts reading my blog. 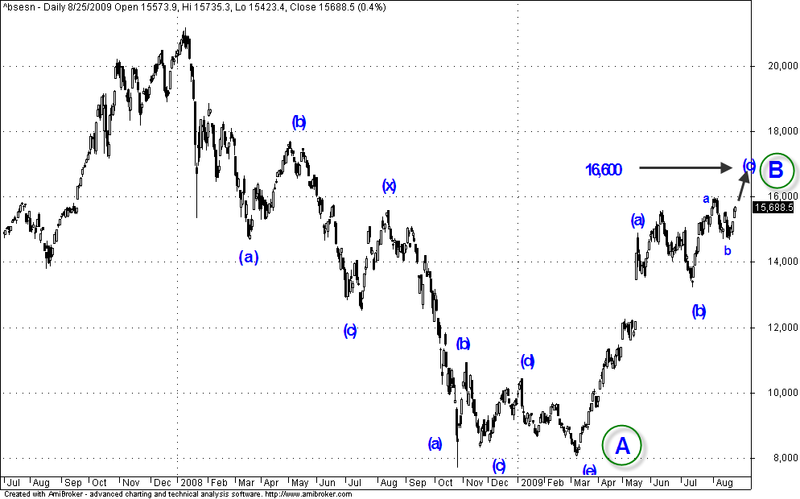 I had made 16,600 as the Peak in the Elliot wave structure as GANN Resistance near 16,600. Nifty 90 min Ichimoku Charts for 12th Aug Trading Nifty 90 min ichimoku charts are shown and it is in sell mode since 26th July and currently nears the resistance cloud zone breakout could bring a directional move towards 5300-5315 levels. Rajendran, i agree with your wave labeling. i think we are in wave B, which itself has a 3 wave structure. wave 1 from march lows to june highs, wave 2 from 4693 to 3919 and the current wave 3 which is currently underway. as we are in the motive wave we should see a 5 wave structure, which can take us as high as 5500.